Taebaeksan Mountain, a holy mountain of the Korean people, is located at the fork of Baekdudaegan Mountain Range, which starts its range from bagdu into the south, heading to Jirisan Mountain. Ever since it has been designated as a provincial park, Taebaeksan Mountain has widened its realm and thus designated as the 22nd national park. 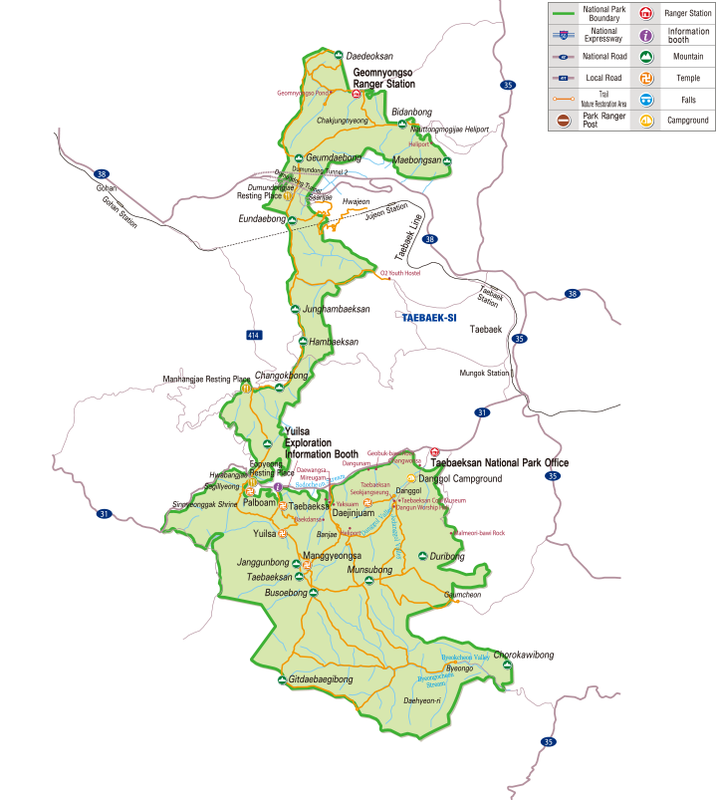 The park ranges from Gangwon-do Province (Taebaek-si, Youngwon-gu, and Jeongseon-gun) to Gyeongsangbuk-do Province (Bongwha-gun) and is 70.052㎢ in area. a place where a harvest ceremony had held for thousands of years, and Geomryongso, source of the Han River. It also has various and outstanding ecological landscapes including the biggest wildflower habitat in the country (Geumdaebong Peak to Daedeoksan Mountain), yew habitat around Janggunbong Peak, and Baekcheon Valley, the world's southernmost lenok habitat.